The beautiful Holiday Inn Express Hotel & Suites Nogales, Arizona is designed for business and built for pleasure. We are conveniently located one hour south of the Tucson International Airport and just minutes away from the Mexico Border. Our close proximity to Mexico is great for both business and leisure travelers as it allows our guests access to 109 American companies such as Motorola, Fortune Brands, Kimberly Clark, Xerox, etc. as well as a wide variety of shopping, dining and tour options in Nogales, Sonora Mexico. The City of Nogales and its neighboring towns such as Tubac, Patagonia, Sonoita and Elgin are rich in history, culture and wildlife. With its majestic mountains and untouched desert landscapes its no wonder the area is home to one of the largest varieties of birds and as such, is internationally renowned among bird watching communities. The Holiday Inn Express Hotel & Suites Nogales offers oversized rooms with a refrigerator, microwave and free high speed wireless internet, not to mention an unforgettable experience filled with such activities as wine tasting at local vineyards, golfing, shopping, bird watching and unique cultural and historical ventures. Whether visiting the area on business or pleasure we are your ideal hospitality provider. 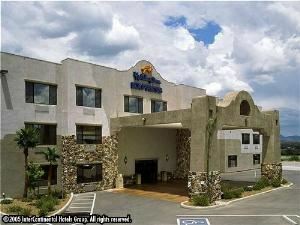 We look forward to hosting you at the Holiday Inn Express Hotel & Suites Nogales, Arizona.